As time goes by we often wonder what would we have done differently if we had our chances again? The fate of life means that we do not get to undo our mistakes or change our choices. Nor do we know how things would have worked out if we had chosen a different path. Yet, in our economically broken Western world, there is one nation that chose a different path. Iceland did not go for a too big to fail choice - after all who was going to help? Iceland went for the full blame the bankers option, including defaulting on all foreign debt and leaving the UK and Netherlands to pick up the bill for defaulting Icelandic banks. Ireland went for bailing out banks it could not afford and believing a promise from the EU that it would help out. 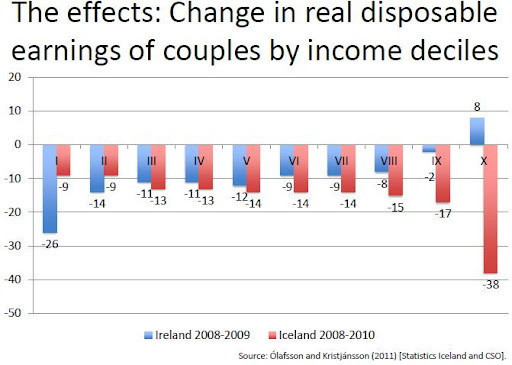 Now Ireland and Iceland both suffered huge jumps in unemployment, whilst the Irish currency held together, the Krona collapsed and with it living standards in Iceland...fora while. But here we are 4 years later and Iceland has 2% growth, is being re-rated in the debt markets, has strong exports and a primary budget surplus. Ireland has only the good exports bit, unemployment remains high, even having the euro as its currency has not kept up the living standards as wages have fallen so far. So here is the comparison, yes Ireland is 10x the size of Iceland and all comparisons will have to be seen in the light of this, but 4 years on and the economies are going in opposite directions. I can;t say that Ireland made the right choice looking at the results - sometimes a hard landing is worth the pain in the medium term. The point is that Iceland has a primary budget surplus so it doesn't need the international bond markets. The UK could had nobody to bail out its banks on its behalf, and if it defaulted on its bonds the markets would have cut its funding. The UK has borrowed an extra half trillion since 2008 and rolled over quite a bit more, none of which would have been possible taking the Icelandic route. Alex do you think us being half a trillion deeper in debt is a good thing? At least Iceland can rebuild from here on. its not over for us yet. We should have "done an Iceland". I'm all for wiping out the rich and starting again. Iceland was brave and it will be better for them in the long run. Which one has lost the most by emigration recently, by proportion. Having watched the 1958 film "The Viking" recently perhaps Iceland's affiliation to more direct thinking modes in conflict situations works better than Ireland's type of Christianity influence response. Northern Wreck was only saved to keep up Labour's votes in Newcastle. Brown didn't bail out the [Un]Equitable. I wonder why?!? Once the Wreck was bunged all the rest followed without a great deal of thought. HBoS was the victim of Brown's great property gamble and did not deserve its fate (although the stupid management did). Then Lloyds was the victim of Brown finding a "solution" for HBoS, and was suckered. But RBS probably was too big to fail outright. But it should have been nationalised completely and broken up and sirfred jailed (better than a bullet in the head like the Chinese do for failure). In the meantime retail and investment must become entirely separate, to stop a repetition of the last decade. Wonder if our councils will start investing in Iceland again.